What is a Nebraska Month to Month Lease Agreement? Nebraska Month to Month Lease Agreement: What Is It? In Nebraska, a month to month agreement is a lease that allows a landlord to set up an at-will tenancy with a renter. This means that the terms of the agreement are valid for only one month, however, the agreement renews at the beginning of each month until either the landlord or the tenant terminates the lease in writing. These types of agreements are ideal for tenants who only need housing for a short period of time, and for landlords who enjoy the flexibility of an open-ended lease. Aside from the short period of time, month to month leases are essentially the same as their year-long counterparts. They contain the same information and terms as traditional yearlong lease agreements such as when rent is due, how much rent is to be paid and to whom, terms of occupancy and other specifics such as parking, and guest information. If the tenant or landlord wishes to terminate the lease, they must do so with a written termination that abides by Nebraska's tenant laws. In the state of Nebraska, a tenant or landlord is required to provide a notice of termination no later than 30 days before the termination date will be effective. 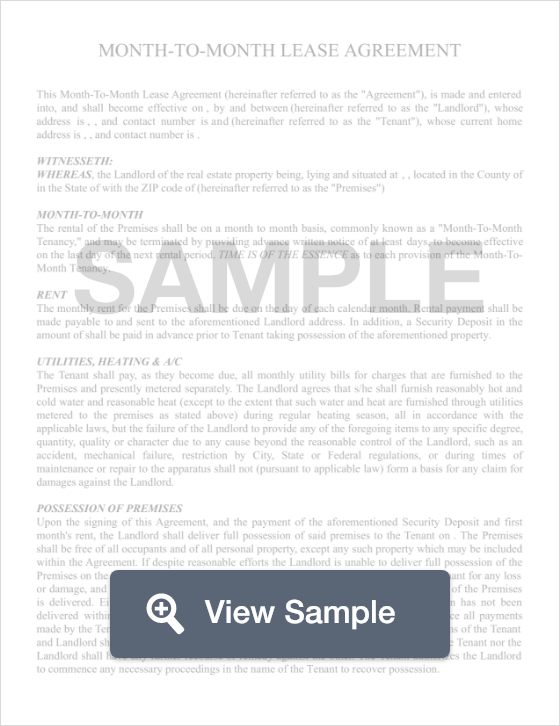 In addition, a lease termination letter must coincide with when rent payments are due.